Optimized schedules balance employee preferences with business needs and demand – creating the perfect schedule for each location. When you optimize a schedule, millions of potential schedule changes are assessed and managers get an instant view of changes that avoid any over and under-staffing while maximizing productivity levels for the available labor budget. Optimizer considers your employee preferences, their availability, company policies and local labor law all at once, ensuring the best possible schedule is created. Improve productivity levels and reduce labor costs by avoiding any over or under staffing throughout every day. Our optimizer analyzes millions of possible schedule scenarios before selecting the right one for each location. Optimizer creates in seconds what managers spend hours each week trying to achieve. 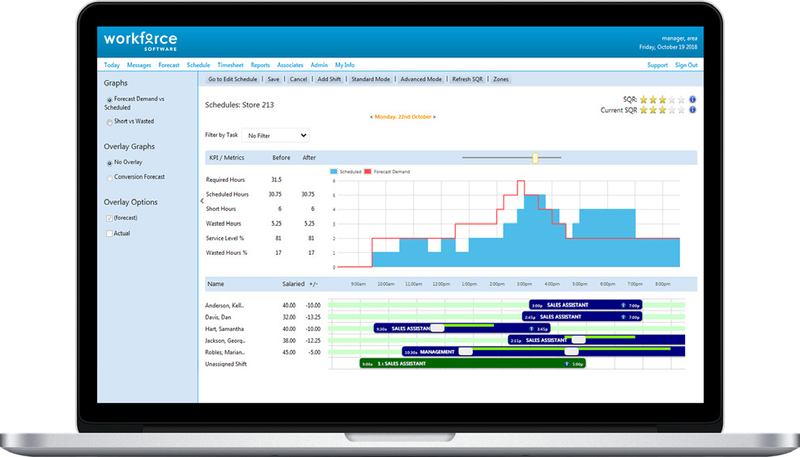 Optimizer can automatically place your top performing employees at the busiest times of day, or it can ensure every new starter is matched with a high performer during their training or probation period. WorkForce understands how much productivity can impact your organizational performance, and how the smallest improvements to local operations can lead to the biggest results for the overall company. Schedules created using optimizer ensure both legislative requirements and organizational policies are adhered to, for example ensuring minimum gaps between shifts, that enough paid or unpaid breaks are allocated (and at the best times) and that contracted hours are not exceeded. Optimizer ensures legally compliant schedules the first time, every time and will alert any manager who tries to publish a non-compliant schedule. Optimized schedules balance employee preferences with business needs and demand – creating schedules that are a win / win for both employer and employee. Our schedules use your HR data, such as holidays or absence, your employees working preferences, for example which days or hours they are available that week submitted via mobile app, and the contractual obligations of the employer, including minimum guaranteed hours or working hour regulations. The optimization process considers every aspect of the schedule and its potential impact on each locations performance.